Photograph of a marble ceiling in the Neminatha Temple at Dilwara on Mount Abu, Rajasthan, taken by Lala Deen Dayal in the 1880s, from the Curzon Collection: 'Views of places proposed to be visited by Their Excellencies Lord & Lady Curzon during Autumn Tour 1902'. Mount Abu remains an important pilgrimage site with five principal Jain temples at Dilwara built between the 11th and 15th centuries. The marble Neminatha or Luna Vasahi Temple is dedicated to Neminatha, the twenty-second Tirthankara (Jain saint) and was built in 1230. It was erected by two wealthy merchants, Vastupala and Tejapala, who were ministers at the 13th-century Bhagela court in Gujarat. 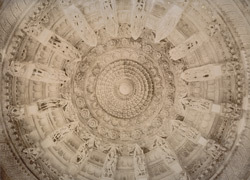 This is a view looking up towards a dome in the temple, carved with figures in niches and concentric rings of scrollwork around a medallion of tracery flowers with a lotus flower in the centre. The walls and pillars of the temple are entirely covered with intricate carvings of figures in niches, geometric friezes and scrollwork.